North America, 18th century In the chaos and violence of the Franco-Indigenous War, Shay Patrick Cormac, a fearless young man and member of the Order of the Assassins, undergoes a sombre transformation that will forever change the future of the colonies. 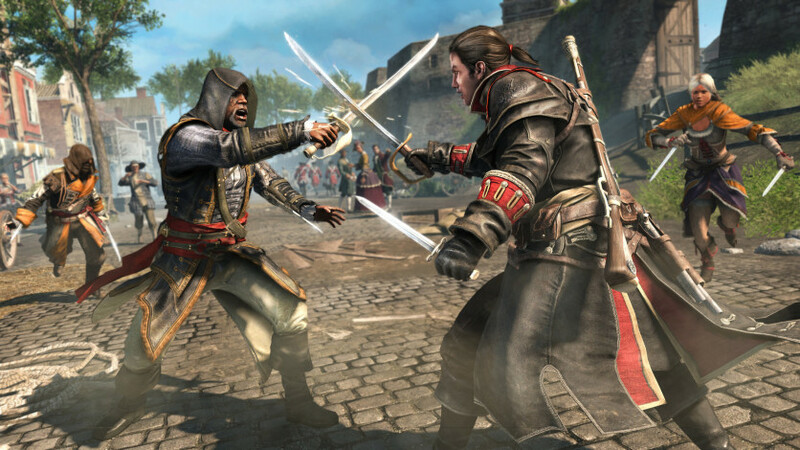 After a dangerous mission tragically ends, Shay abandons the Assassins who, in response, try to take their life. Banned by those who once called brothers, Shay begins a mission to destroy all those who betrayed him and ultimately become the most feared Assassin hunter in history. 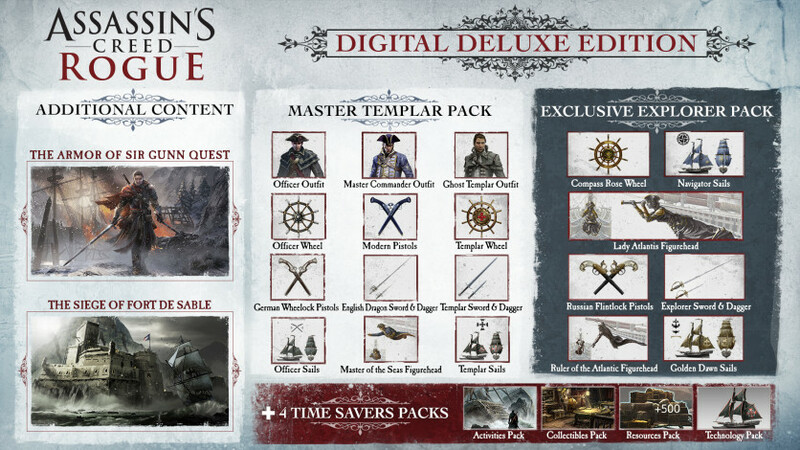 Featuring Assassin's Creed® Rogue, the darkest chapter in the Assassin's Creed® franchise ever produced. In the role of Shay, you will live the slow transformation from Assassin to Assassin Hunter. Follow your own conviction and set out on an extraordinary journey through New York City, through the valley of the Wild River, to the frozen waters of the North Atlantic, in pursuit of your ultimate goal: to destroy the Assassins. Use Shay's deadly pressure rifle for both short and long range combat. Distract, eliminate, or confuse enemies using a variety of ammunition, including specialty grenades. Protect yourself from hidden killer with your enhanced Aquiline Vision. Use the Aquiline Vision to constantly monitor the surroundings and detect Assassins, hidden in the shadows, on the rooftops or in the crowd. Slow down into darkness - Witness the transformation of Shay from an adventurous Assassin to a sinister and faithful Templar, willing to eliminate his former allies. Accompany firsthand the events that will lead Shay to a dark path in circumstances that will forever change the fate of the Order of Assassins. New enemy tactics. 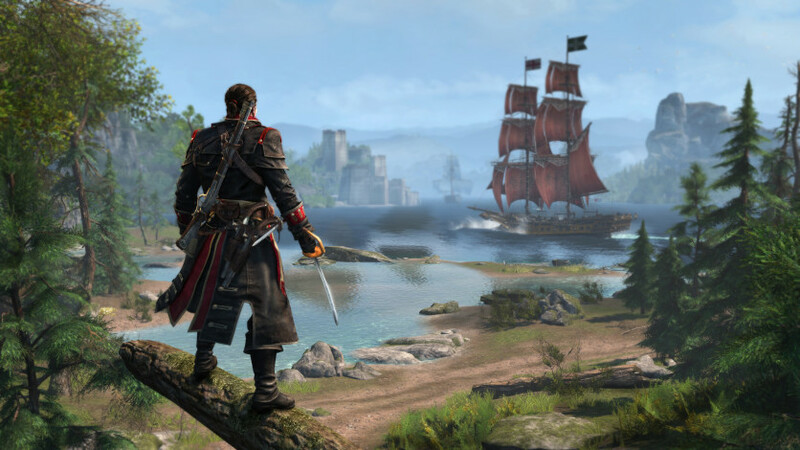 Defend yourself from Assassins who try to board your ship and defeat their crew. Eject them quickly so you do not lose too many crew members. New weapons, such as flammable oil, leave a trail of fire burning enemy ships, and the Puckle machine gun, capable of firing continuously. An Arctic world full of possibilities. 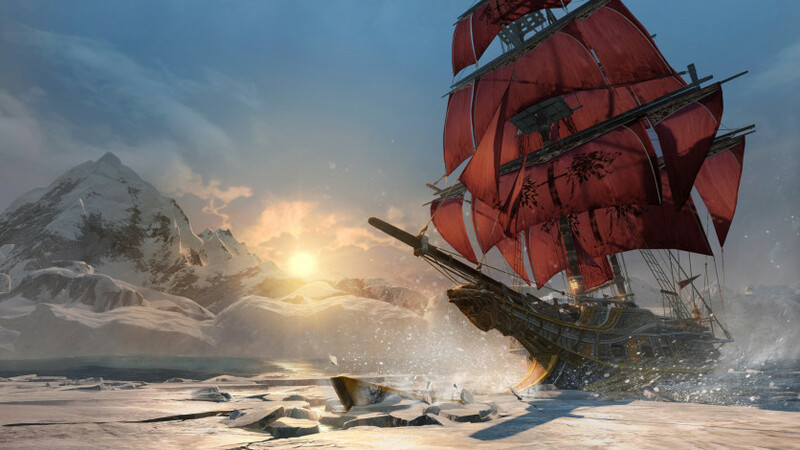 Break through layers of ice with your ship to discover hidden locations and use icebergs as cover during naval battles. North Atlantic Ocean: Experience the icy winds and huge Arctic icebergs in this large naval park. Valley of the Rivers: A vast and hybrid scenery of the American border, which mixes rivers perfect for navigation and exploration on dry land. New York City: One of the most famous cities in the world, totally recreated as it was in the eighteenth century. Missão A Armadura de Sir Gunn: Explore a América do Norte para encontrar os restos mortais de Sir Gunn e solucionar seu grande mistério. O Cerco ao Forte de Sable: Continue o combate no mar com esta missão bônus de ataque ao forte situado em um território inexplorado, no Atlântico Norte do Novo Mundo. Pacote O Mestre Templário: Torne-se o Templário mais temido em terra ou no mar com esta exclusiva coleção de armas, roupas e itens de navio. Inclui todas as armas, itens e roupas do Pacote Templário, Pacote de Oficial e Pacote de Comandante. Pacote O Explorador: Uma coleção exclusiva de armas e itens para garantir passagem segura por territórios inexplorados e perigosos. Quatro pacotes de Economia de Tempo: Quer avançar rápido pelo jogo? Economize tempo e esforço usando esses quatro pacotes exclusivos. Inclui as Atividades, Recursos, Colecionáveis de Economia de Tempo e o Pacote de Tecnologia. Use cada pacote individualmente ou divida com um amigo! Observação: É necessário concluir a missão O Cerco ao Forte de Sable para gerar e desbloquear o baú com todos os itens dos pacotes O Explorador e Mestre Templário.